What is a Pantheon movie? A movie whose every component is perfection; the combination of which is greater than the sum of its parts; and whose perfection is untouched by the intervening years. A MAN FOR ALL SEASONS is not just a Pantheon movie; it's a deeply relevant, deeply personal film for me. The subject matter is the bedrock to its greatness. A MAN FOR ALL SEASONS is one of those films that perfectly articulates a rupture in a nation's intellectual and political life. More particularly, it has that rarest of things as its protagnists - a hero who is also a warm, loving, witty man. We are in Tudor England and Henry VIII is desperate for a male heir. His desperation leads him to betray the Church of which he was a staunch Defender. The nobles, Bishops and Universities all assent to a parliamentary decree making Henry supreme governor of the Church in England. That Church gives him a divorce and then marries him to Anne Boleyn. This is not simply a sacrifice of principle to statescraft. After all, one might rightly have criticised the Catholic Church for its corruption. However, Henry's Cardinal Wolsey makes it clear that English political expediency trumps all. Against such turbulent times, step forward Thomas More, an honest lawyer. ("When was there last a Chancellor whose possessions after three years in office totaled one hundred pounds and a gold chain?") While friend to the king, his integrity prevents him from publicly assenting to the Act of Succession or approving of Henry's marriage to Anne. But as a loyal subject he will not publicly denounce Henry. Instead, he aims to tread a tightrope of silence and absence from public life. More is clever and witty but he is also naive. His wife, Lady Alice, points this out. The establishment will not allow More to sit quietly. "His silence bellows" because he is known to be honest. Thus we see a slow grinding of the wheels of state - More is thrown in the Tower of London and, when Richard Rich perjures himself, More is executed. Screen-writer Robert Bolt (LAWRENCE OF ARABIA, DOCTOR ZHIVAGO) crafts a brilliant drama out of this superb material. He captures More's bizarre mix of intellect and naivety. He is careful to show Henry's close relationship with More early in the film, but equally careful to keep Henry absent in the latter half. Henry is too careful - too squeamish - to prosecute More directly. I also like what he does with the minor characters - essaying their character quirks very quickly. There's a great scene where Henry meets More's daughter Meg for the first time. More is known for having eccentrically educated his daughter. Henry tests her on her latin and she responds in fluent, eloquent latin. As she rattles on, Henry loses interest and actually turns away. His ego has been piqued. He turns back, showing off his fine calf! Pure machismo! Sir Thomas More: Why not be a teacher? You'd be a fine teacher; perhaps a great one. Sir Thomas More: Why Richard, it profits a man nothing to give his soul for the whole world... but for Wales? The subject matter of this film is, then, of the highest importance: moral conscience versus state expediency. But there is also an exchange in this film that speaks more loudly to contemporary audiences, especially those who do not watch the film as hagiography. Even for me, as a Catholic, the following exchange is the most resonant and personally affecting in the film. Richard Rich has just left More and More's family are desperate for Rich to be arrested. They are right. Rich s a dangerous, traiterous man and will eventually do for More. But More refuses to arrest him. So follows an exchange that defines for me the battle between "security" and "liberty" and comes down firmly in favour of the latter. It is the exchange that defines my views on this issue to this day, especially in the context of the War on Terror. The story and script make A MAN FOR ALL SEASONS a Pantheon film but it takes great direction and acting to breathe life into an intellectual, abstract film. Fred Zinnemann (OKLAHOMA!, FROM HERE TO ETERNITY) knows better than to distract from the script with flashy camera angles or over-wrought emotional displays. He also assembles a perfect cast. Zinnemann had the balls to eschew higher-wattage actors (Charlton Heston, Laurence Olivier, Alec Guinness) in favour of class British thesp Paul Schofield in the role of Thomas More. He surrounds him with exeptional character actors - notably Wendy Hiller as Lady Alice More and Leo McKern as Thomas Cromwell. In the minor parts, he casts actors who would go on to be great, showing his eye for talent. So we have John Hurt as Rich, Susannah York as Margaret More, Corin Redgrave as William Roper and Vanessa Redgrave as Anne Boleyn. Robert Shaw is also fantastic as Henry VIII. Where Zinnemann does go for a big name, there is no sense of compromise. 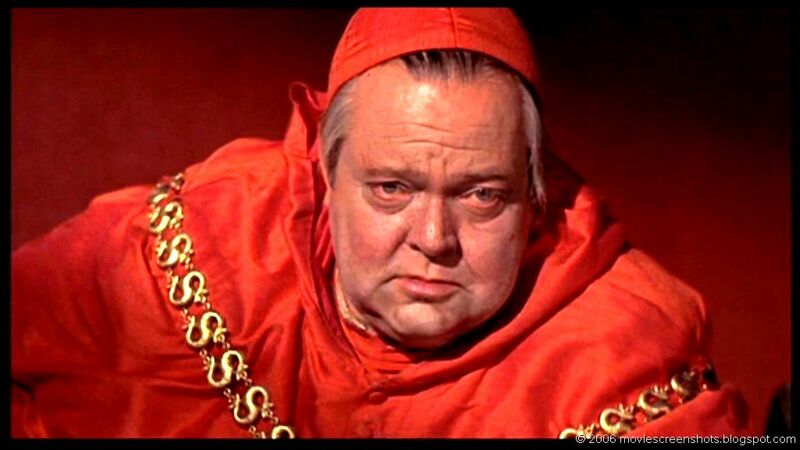 A bloated, domineering, insidious Orson Welles embodies the realpolitik of Cardinal Wolsey. Apart from the casting, the technical aspects of the film are well-handled, with nicely photographed colour shots of the river and costume design all winning Oscars. All in all, A MAN FOR ALL SEASONS is one of those films that engages you on an emotional and intellectual level and has the capability to change the way in which you think about the bed-rock issues of life. It's a shame that it sometimes gets cast as a movie for Catholics or history buffs. After all, the battles between Church and State; private and public morality; state security and individual liberty; remain painfully relevant today. A MAN FOR ALL SEASONS was originally released in 1966. It won the Oscar for Best Film (Fred Zinneman), Best Director (Fred Zinneman), Best Actor (Paul Scofield), Best Cinematography (Ted Moore), Best Costume Design (Elizabeth Haffenden, Joan Bridge), Best Screenplay (Robert Bolt.) In addition, Robert Shaw and Wendy Hiller were nominated for their supporting roles. The film is widely available on DVD.